I absolutely love when unexpected things happen that remind me that the thoughts and desires that I send out are energy. And they will find their way back to me, manifesting in their own time. I am delighted and amazed also when an image pops into my head, another form of thought, and shortly after that, the image becomes reality. For my first today, I acquired two items. One I have been searching for since early April. The other just came into my awareness last night. This afternoon, I traveled to Arkansas with Greg to visit his dad. I dearly love this kind, gentle man. At 93 he still cares for himself and has a sense of humor, although by his own confession, his energy levels are low and at a soul level, he is even more weary. It is always a pleasure to visit with him and help him in small ways, which are all he will allow. After lunch, we stopped at the grocery store to restock essentials for him, and Greg picked up a couple of packages of bite sized candy bars for his dad to snack on. Dad Moore doesn’t eat a lot, but he still has a sweet tooth and enjoys an occasional treat. Back home, while Greg and his dad were looking at old photos and reminiscing, I rummaged through cupboards, looking for a little candy dish to put the chocolates in. I saw the corner of a small plastic bag sticking up and curious, pulled it free of the dainty bowl it was tucked into. I know I made some kind of sound of surprise! Something akin to “Oh my goodness!” Within the sealed plastic bag were three wooden teaspoons, from Taiwan. Ever since I visited Teavana, the loose tea store in Springfield, back on April 2, I have been searching for wooden teaspoons. 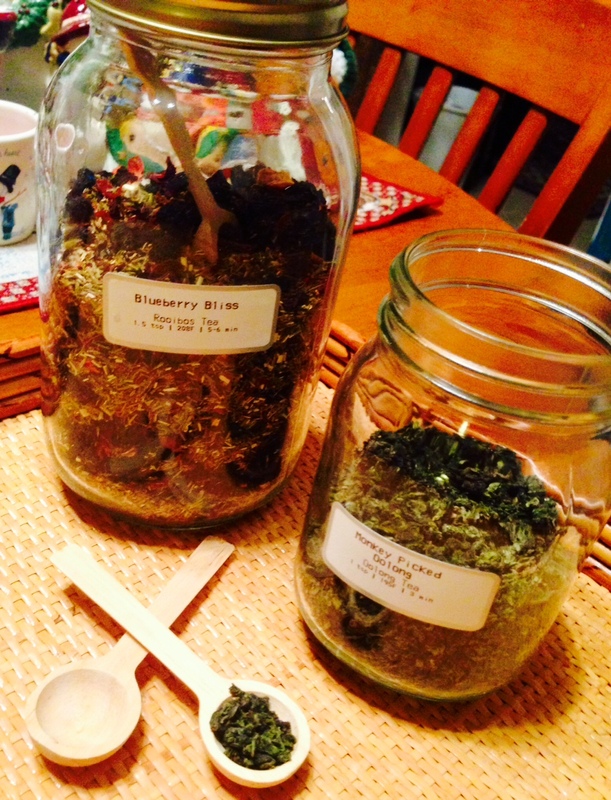 I have my loose tea that I purchased in clear mason jars. I measure out the tea by the teaspoon, and I’ve wanted tiny wooden spoons just because they look so much more earthy than having a plastic teaspoon stuck in the jar, as I do now. I’ve looked in several retail stores in Joplin, without success. I eventually decided I’d find them someday, at the perfect time. Which….happened to be today! Those spoons have been in that cupboard for at least 15 years, since Greg’s mom passed 15 years ago next month and Greg’s dad has left every item in its place, unchanged. I’ve never seen these spoons before and have no idea when Mimi received them or what the story is behind them. I only know she had the spoons tucked away, and now I have them. Dad Moore, generous man that he is, told me I could have them. I am thrilled. After a wonderful afternoon of visiting with Dad Moore, and running some errands, we prepared to leave. Greg paused in the kitchen to get some info from his dad, and asked me to turn on the overhead light. As I flipped the light on, my attention was caught by an item hanging on the wall, directly above the light switch. I know my head tilted to the side, like a dog who is trying to understand the words being spoken to her. 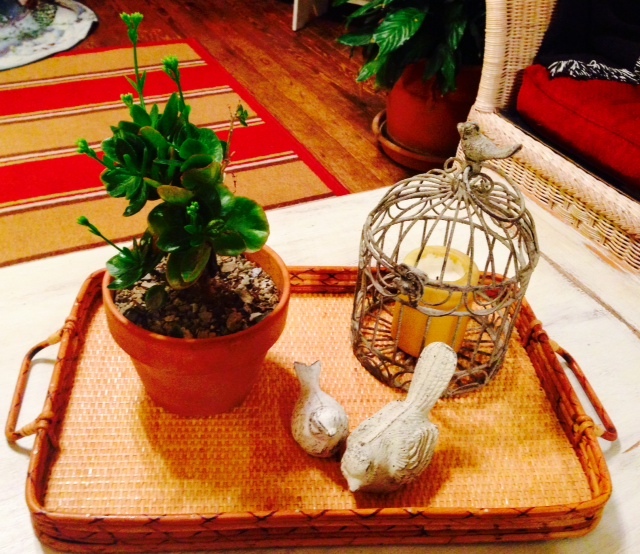 Last night, as I was decorating my house for Christmas, I created a small coffee table vignette, for the first time, I might add. I liked the simplicity of it and the way it looked. And yet….it needed something. 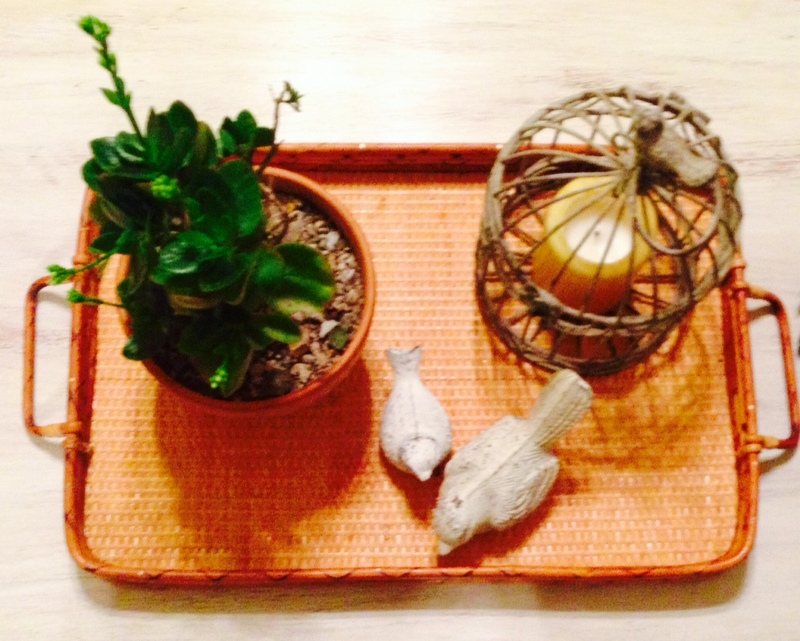 It needed a wooden tray beneath the grouping. As I headed to Arkansas today, I was thinking about that wooden tray. I have one in my bedroom, on my bed, holding a book, a teacup and my great-grandmother’s hankie. I could use that one, I mused…but in my mind, I saw a lighter colored tray with shorter sides. Perhaps a bamboo one? The image I had was very clear. 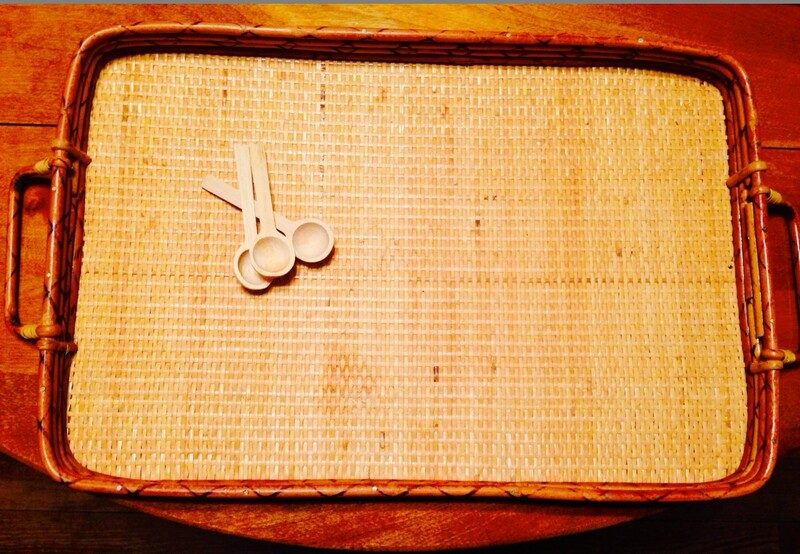 Now, standing in the kitchen, while Greg and his dad discussed eye doctors and appointments, I was stunned to see the very wooden tray that had popped into my mind, hanging on the wall. I had literally walked by it five or six times this afternoon, without seeing it. The light illuminated it for me. It could be that the image of that particular tray surfaced in my mind because subconsciously, I have seen it there in the kitchen many times without registering it. I don’t know. I don’t care. The tray I had been thinking about, since last night, was right there before me. I removed it from the wall and turned around with it in my hands, perhaps with my head still tilted to the side. Again, Greg’s dad graciously gifted me with it, with a smile and a wave of his hand. These items now have a place of honor in my home. I will enjoy the tray and the spoons, and I’ll smile every time I scoop out tea or arrange a vignette or serve tea on the tray. Even better, I cannot look at those simple reminders of the wonders and mysteries of the universe without giving thanks and expressing joy.